This is my favorite salad to serve at holiday get-togethers! It is elegant, delicious, and simple to prepare. We will be making it with for Thanksgiving dinner this year. What makes this salad truly amazing is the maple vinaigrette. It has the perfect balance of sweet and tang with great flavor from 2 different kinds of mustard. I love making my own salad dressings. They are very easy to make and it’s great to know exactly what is going into your food. 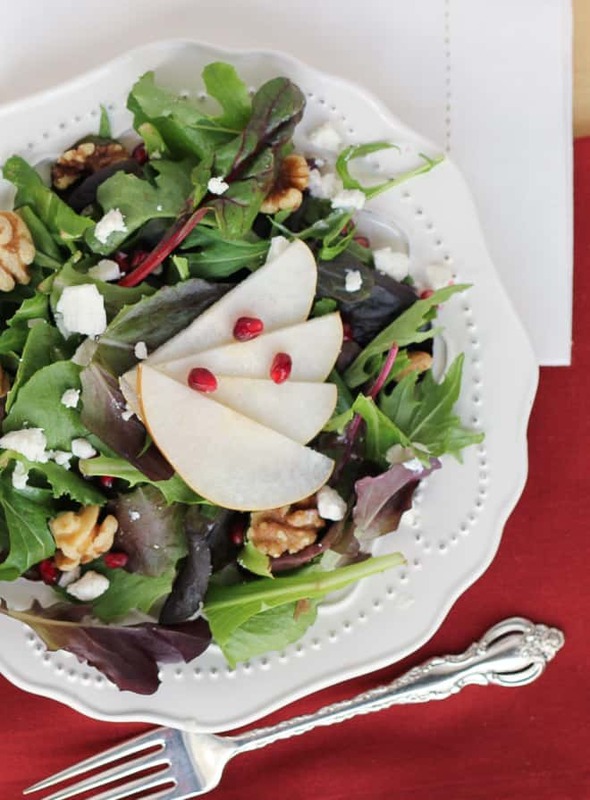 The flavor of the dressing with the sweet pears, tangy pomegranate seeds, and toasty nuts is unbeatable. 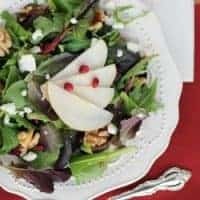 I like using Asian pears in this salad but any pear will work! This salad is wonderful with my favorite honey goat cheese from Trader Joe’s. It also works great with feta. I am currently avoiding all dairy, so I will not be putting any cheese on my salad this year. But it is perfectly delicious without the cheese too! Place the garlic, mustards, salt, pepper, maple syrup, and vinegar in a blender. Process to combine until smooth. With the blender running, slowly drizzle in the olive oil. Taste and add more salt/pepper if needed. 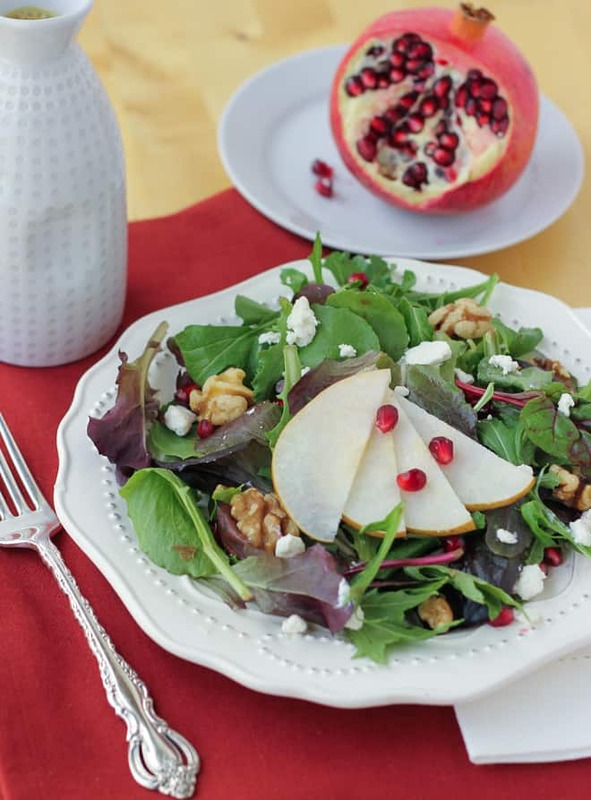 Place the greens, pear, pomegranate seeds, and walnuts in a large bowl. 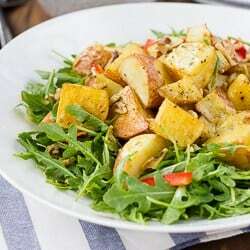 Toss with some of the dressing until just coated – you probably won’t use it all. Sprinkle the top with goat cheese. I like tossing the salad before adding the goat cheese so the cheese doesn’t get lumpy. 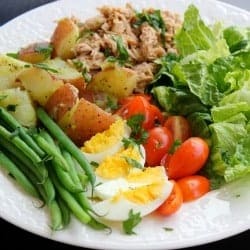 Alternatively you can toss the greens in the dressing then assemble individual plates with the rest of the ingredients. Enjoy! 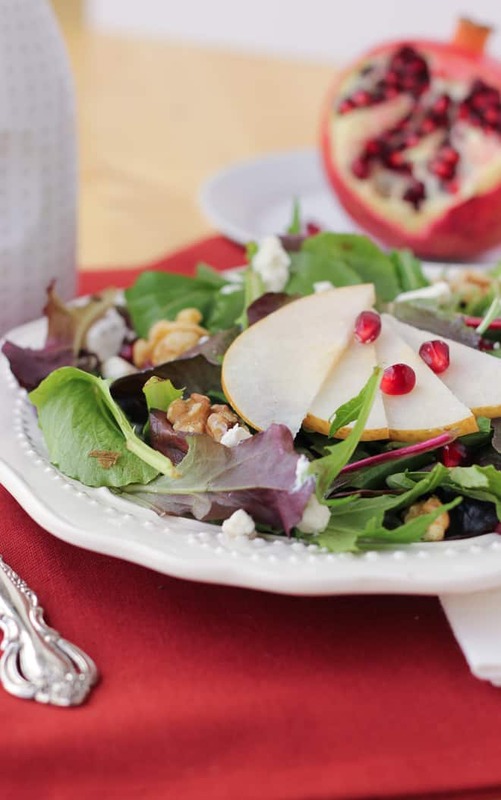 *My favorite honey goat cheese from Trader Joe’s is wonderful in this salad! Feta cheese also works great. This year I will be leaving the cheese off on my plate because I am avoiding dairy. But it is still delicious with no cheese! Made this for Thanksgiving and it was a hit. Very yummy! 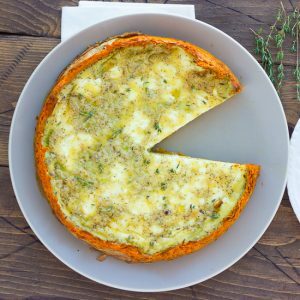 Absolutely lovely recipe! Super delicious. Thank you.